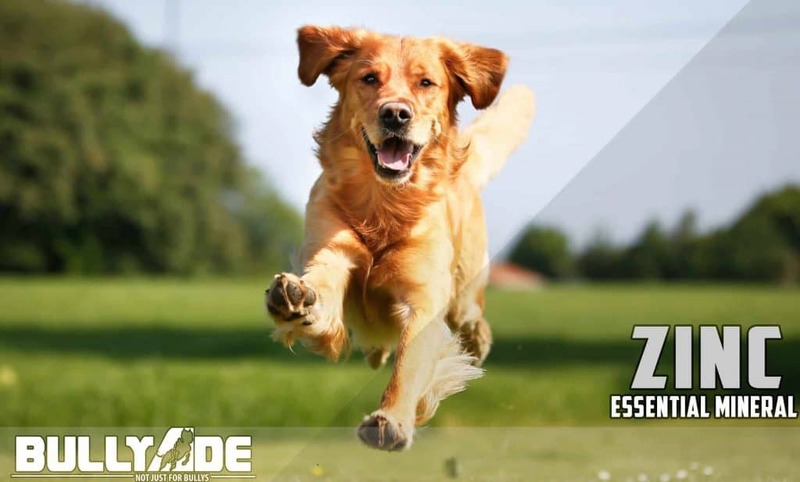 Zinc is one of the most essential minerals that are supplemented in today’s commercials diets for dogs. It helps improve the quality of your dogs skin and coat. Zinc is involved in an array of metabolic processes in the body. It has been identified in playing a key role in metabolic pathways, healthy immune system, production of numerous hormones and plays a vital role in cell reproduction.Zine is one of the more powerful antioxidants in the body. Zinc deficiency in the dog most commonly occurs as a skin condition called “zinc responsive dermatitis”. The usual symptoms are hair loss scaling, crusting of the skin, loss of appetite and weight loss. Lesions often are found and their foot pads may become scaly. Also the hair coat will dull and dry. The 1st most easily missed sign of Zinc Deficiency is reduced appetite and gradual weight loss. A prolonged deficiency starts to show more serious signs. Zinc improves the quality of the skin coat and hair. It plays a vital role in the Dogs Immune System function and Thyroid Function. Zine is needed for physiological processes and several metabolic functions.